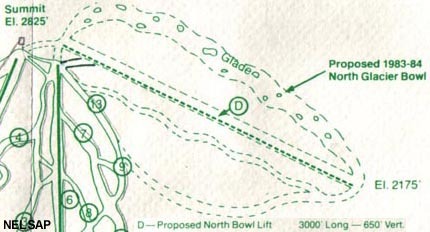 Along with the development of the Southbrook area, plans were made to build a complex to the north of the main chairlift. The new lift would have covered 650 to 850 vertical feet over a 3,000 foot run, ending above the existing ski area summit. Three trails and a glade would have been cut. While the development was planned for the 1983-84 season, construction never started, as the Southbrook expansion was halted. 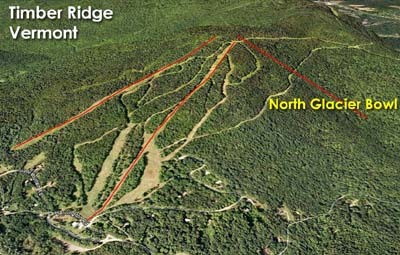 Timber Ridge would soon be purchased by Magic Mountain. Soon thereafter, connector trails were cut between the two areas, running through the top portion of the proposed North Glacier complex.